DEAR MAYO CLINIC: What is the best way to remove a tick? We live near a grassy area and find several every summer, and I worry about Lyme disease. But there is so much conflicting information online about how to remove a tick properly and what to do after. ANSWER: If you find a tick on your skin, remove it as quickly as possible. But removing the tick correctly is also critical. Ticks can transfer disease-causing organisms (germs) in one bite. That bite can result in various illnesses, including Lyme disease. 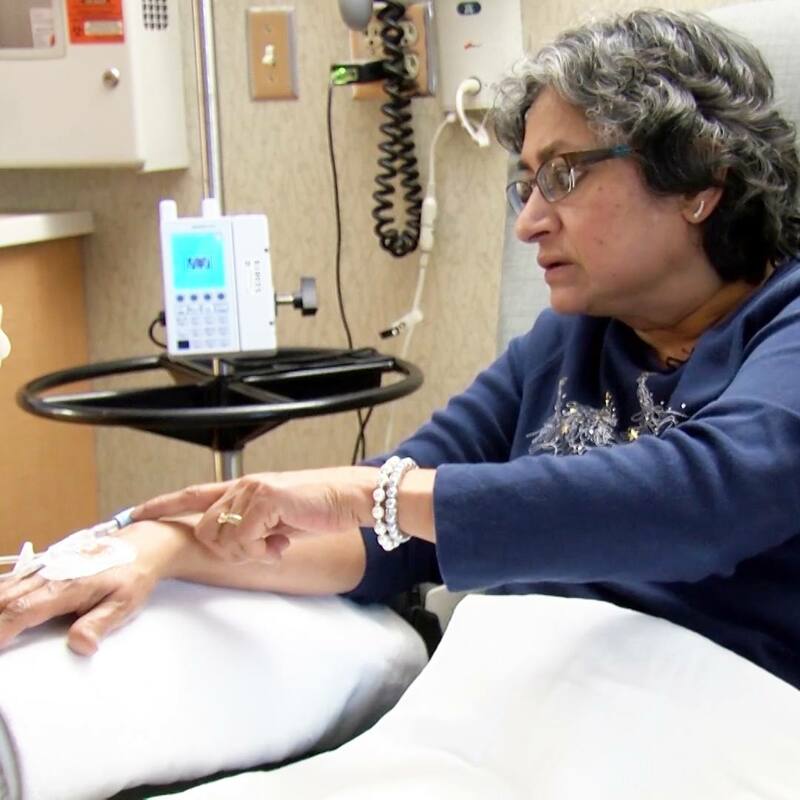 These illnesses are often mild, but if left untreated can have long-lasting effects. For this reason, it’s important to be aware of the presence of tick habitats, guard against tick bites and know what to do if you get bitten. Antibiotic treatment usually succeeds in getting rid of the infection, especially when started early. There are steps you can take to prevent ticks from getting to your skin in the first place. Try to avoid areas where ticks are found, such as tall grasses, shrubs and leaf litter. When you go outside, wear long sleeves and pants, as well as sock and shoes. If you think you may come in contact with ticks, protect yourself further by spraying exposed skin with a repellent containing DEET or picaridin. 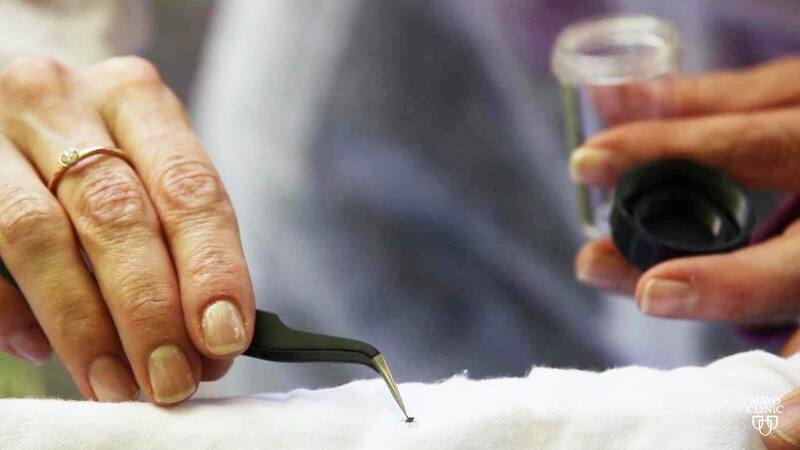 You also can apply permethrin to your clothing. Remember to check yourself, family members and your pets for ticks after being outdoors. 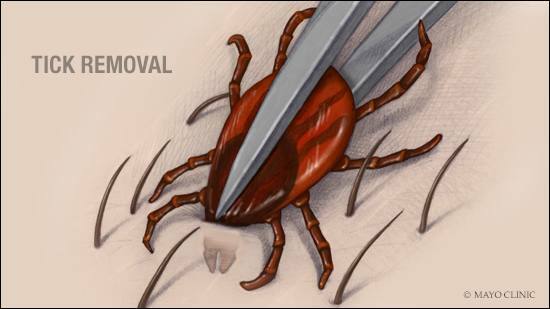 To remove a tick that is embedded in the skin, grasp the tick as close to the skin’s surface as possible, using tweezers if available. Pull upward with a steady, continuous motion. To ensure the whole tick is removed, try not to twist it or jerk it. If mouth parts of the tick remain in the skin, leave the area alone and let the skin heal. Your body will expel the mouth parts over time. After removal, clean the area with an antiseptic, such as rubbing alcohol or soap and water. Place the tick in a plastic bag in case you develop any symptoms that may be caused by a tick-borne infection. Early symptoms can include fever, chills, headache, joint pain and gastrointestinal upset, which can occur in various combinations. Sometimes, a characteristic rash may occur, as well. If you experience any of these and may have been exposed to ticks, see your health care provider right away. Bring the tick with you, if possible. If you live in an area where Lyme disease is highly prevalent — most commonly the Upper Midwest and Northeast U.S. — and the tick that you’ve removed is swollen and engorged, discuss with your health care provider whether an antibiotic such as doxycycline should be prescribed to prevent Lyme disease. Lyme disease, which can cause headache, fever, joint pain and other flu-like symptoms, often is accompanied by an expanding red area that sometimes clears in the center, forming a bull’s-eye pattern. In later stages, Lyme disease can cause lingering joint pain and inflammation, heart palpitations, and various neurological problems. Lyme disease, which is the most common tick-borne illness in the U.S., is transmitted by the bite of an infected black-legged tick, commonly known as a deer tick. But it’s important to be aware that the black-legged tick also can transmit other organisms, including those that cause anaplasmosis and babesiosis. Also, different ticks can transmit other illnesses, including Rocky Mountain spotted fever, ehrlichiosis and tularemia.